Nights are made for chilling and chatting, and our renowned guides love nothing more than showing you the river when all the other boats have disappeared, and with just the winding Thames and London’s romantic sights between you and the sunset, you’ll feel like the most important people in town. With only the very best hand-picked guides at your service, you’ll soon be giggling past the Gherkin and tittering by the Tower. As Tower Bridge cruises into view settle into your seat and enjoy the twinkle of London’s evening light show, as things prepare to heat up! Hold on tight as your expert skipper opens the throttles and rockets you down the river! Find out why we’re famous for our speedboat experiences as we twist and turn making Canary Wharf feel like the Canary Islands! Naturally, we’ll be playing all the latest summer hits giving this the makings of the best summer yet! Our high speed summer rides are sure to take your breath away, so once back to Tower Bridge we’ll bring you back down to earth with a cocktail specially made by the renowned London Cocktail Company to calm your nerves and bring you back to earth. Bobble back to the London Eye feeling fired up and raring to take on the best summer yet. Thames Rockets have teamed up with DesignMyNight to bring you the ultimate end of day (or start of night!) super-speedy summer speedboat ride. The sun’s out and the evenings are long which can only mean one thing. 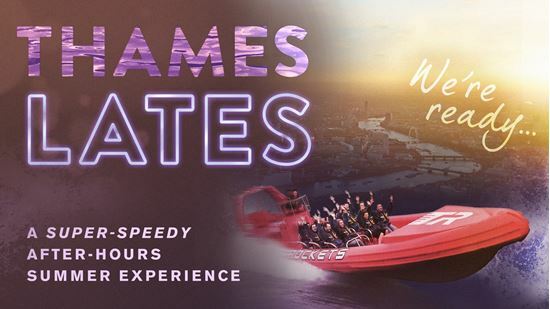 *Thames Lates trips are available Thursday, Friday and Saturday evenings departing from the London Eye Pier. "Amazing Adventure aboard the Thames rocket"
On Saturday December 2nd we had a truly amazing adventure on the Thames rocket. Nick our guide was both informative and amusing and he really did enhance our experience. i would highly recommend this trip to anyone who wishes to see London from a different angle. From the moment you arrive you are welcomed and made to feel safe and relaxed. Everything is provided (although wrap up warm) and explained. Stacey our guide was hilarious, she should be on the stage and value for money in herself. The trip was thrilling and white knuckle at times and even when the speed had to be reduced in certain zones of the Thames you still have a great time seeing our glorious capital from another angle...I thoroughly recommend this.